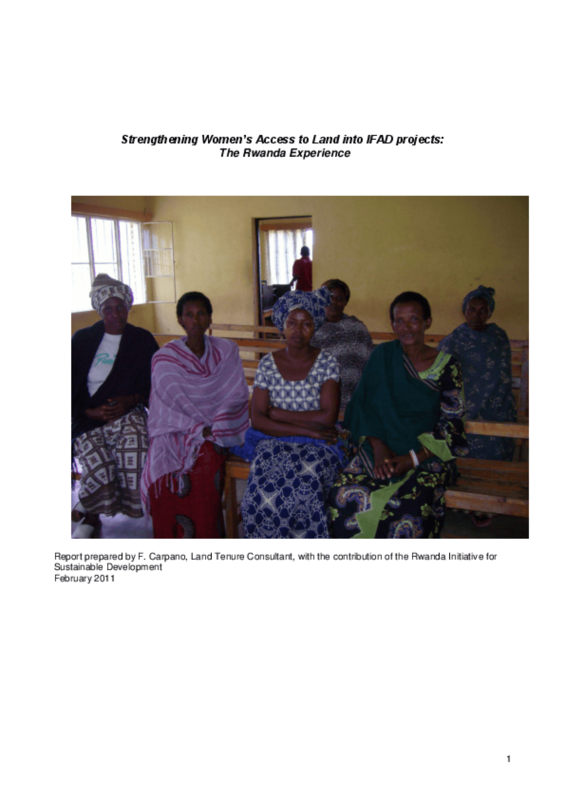 This paper is a joint effort of IFAD and RISD to analyse and investigate women's land rights in Rwanda. It presents the outcomes of the investigation on women?s land rights and its implications in the redistribution, delimitation and registration process carried out in the Nyagatare, Gatsibo, Kayonza and Kirehe Districts in the Eastern Province. For the assessment, meetings were held in the four Districts, with IFAD project staff, beneficiaries, Cell and District Executive Secretaries, Districts Mayors, members of various men and women cooperatives, District Land Officers, members of Cell and District Land Committees. Copyright 2011 International Fund for Agricultural Development (IFAD).